It is in our nature to respond and comfort the cries of our babies, whether they be of the human or canine persuasion. Of course, cries of true distress should not be ignored, but demand behaviors are a different matter. Yips of protest when your dog is first left alone in the crate, or an attention-seeking pup demanding to be plucked up into your lap, should not get the desired result, or you will be beleaguered by these behaviors for life. Instead, ask your dog for a polite sit (the doggie equivalent of “please”) before petting her. Approach her crate only when she’s calm and quiet. If your puppy barks at you for attention or for food, turn your back to her, or put her food away and leave the kitchen. In so doing, you’re teaching her that these behaviors impede progress rather than hasten it. Recreational barking is often misdiagnosed as separation anxiety because it frequently happens when the family is absent. When barking is the sole symptom, first investigate the possibility that it’s recreational. 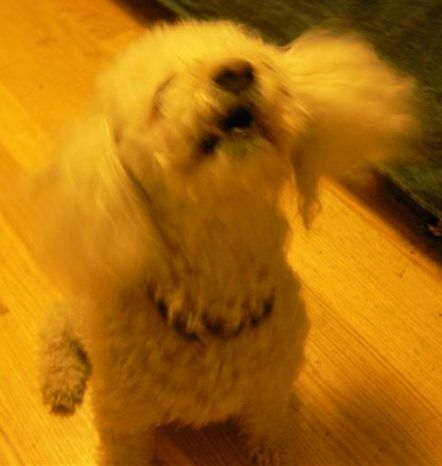 The act of barking is self-reinforcing so it is a behavior that is likely to intensify without modification. Increase exercise, particularly before leaving for long periods of time, so that your dog is tired and ready for a rest in your absence. Hire a dog walker to break up the time that he is left alone. Incorporate fun mental challenges like stuffed puzzle toys for your pup to work on in solitude. Leave some classical music playing: It can be relaxing and it can also dampen outside noises that might provoke your dog to bark. As a last resort, the use of a citronella bark collar can inhibit the behavior by establishing an unpleasant consequence. You must treat the underlying cause of your dog’s barking by gradually building his tolerance to periods of separation. (See the article Home Alone.) Most importantly, never use punishment in an attempt to decrease separation anxiety-related barking, as it will only increase the anxiety in an already anxious dog. Under-socialized dogs may bark when in the presence of certain people, other dogs, or unfamiliar circumstances. My dog Trista barked when she saw horses for the first time on Mackinac Island in Michigan. This was fairly problematic since Mackinac relies on horses and horse-drawn vehicles for the majority of its transport. Within ten minutes of her first contact with horses, Trista was able to sit quietly near horses and even go for a horse-drawn carriage ride with the family. By using desensitization and counter-conditioning (as described in my article Harnessing the Power of Pavlov), the fear was treated and thus her barking was eliminated. One of my clients has a darling English Bulldog named Bella. Bella is a happy girl and so she should be: She has an affectionate, attentive mom and lives a very good life. There are times, though, when Bella needs to speak up! – when her Tricky Treat Ball rolls out of her reach under the furniture or when she needs a potty break. Bella’s not pushy, though; she lets out a single yap and waits for the attention she requires. This is perfectly appropriate doggie behavior. Gone are the days when dogs are to be seen and not heard. Communication is a necessary and essential part of our relationships with our canine family members and should not be squelched completely. So, rather than barking back at your dog, identify her grievance – whether it be one of an emotionally stressed dog or of a too-pampered pooch – and treat the cause. * Parts of this article are excerpted from Laura Garber's book, Bringing Up Puppy.